If you’re of a certain age, it’s likely that your mother arranged to have your baby shoes bronzed. And some of us are lucky enough to have those shoes (or shoe) in our possession. 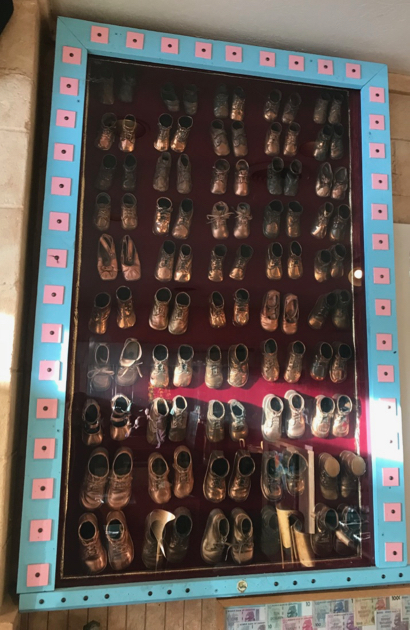 Stop in at Buck’s in Woodside and you’ll get to see dozens of bronzed shoes, thanks to a call put out by owner James McGiven in an effort to add to his eclectic collection of stuff on display at the restaurant. Interested in learning more about bronzing baby shoes? The website Baby Products Mom has the scoop. Wow long lasting shoes eh?